The future of attorney bios. How personal is too personal? As I wrote in my previous blog post, I think that it is inevitable that attorney bios will evolve to include more personal information about attorneys. In times past, prospects may have visited your office, where they could have seen your fishing trophies and handshake photos. In the Facebook age — as more business is done long distance — relationships will be built online. How exactly will this change manifest itself? What will be the limits of decorum? We can only guess. However, two firms have recently experimented with a more personal approach to bios. And both are worth looking at. Axiom – Axiom is not a law firm by traditional standards. As I understand it, they’re more like a placement agency. Whatever they are, they have attorney bios that are a huge departure from the norm. Their approach focuses almost exclusively on their attorneys’ lifestyles -- using lush full-screen photos, video documentaries and very little text. They have successfully positioned themselves as different from the white-shoe law firms they apparently seek to displace. 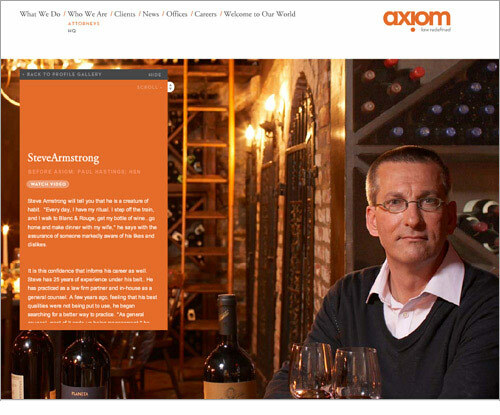 My thoughts: Axiom’s approach is compelling (I checked out every bio and watched every video). However, I don’t think that their heavily personal approach is right for most law firms. For one thing, their bios lack the most important element: proof that the profiled attorney is an expert in his niche. Their bios contain no meat -- no articles, no case studies and no presentations. That said, I could see their use of lush attorney photos and video documentaries being adopted by other firms. 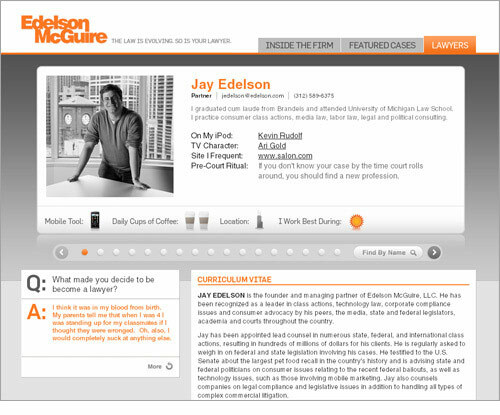 Edelson McGuire – Edelson is a 17-attorney firm headquartered in Chicago. Their tagline is “Law is Evolving…So is Your Lawyer.” Their entire website is a departure from the traditional law firm formula. Bios feature casual photos (no ties) and lots of personal tidbits. For example, for each attorney, you learn what’s on their iPod and how many cups of coffee they drink each day. 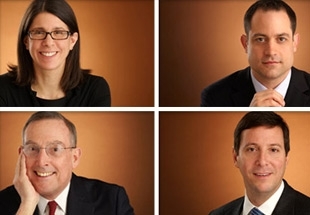 My thoughts: The Edelson McGuire bios offer some fun personal details about their attorneys. However, I think that most prospects might find their approach a bit too playful. While they offer more text than Axiom, Edelson’s bios also lack in-depth content that really demonstrates focused expertise. While these organizations are clearly pointed in the right direction, I think that both went too far in focusing on the personal and neglecting the professional. It’s vital that the bio makes the case that you are one of the leading experts in your niche. Any personal information should complement that message – not dominate it. One last thought: Both of these websites are orange. Has orange become the new “progressive” alternative to blue? I agree – a very helpful and thought provoking blog. I work in a practice in Christchurch New Zealand where, despite Kiwis having a reputation of being laid back, the legal profession is still somewhat conservative and cautious (reflected in their websites) but where the local community has a very strong sense of identity. This leads me to think that one area where law firms can and should emphasise the personal is their work in the local community, both on a firm wide level and an individual level. Whether individual lawyers or law firms work pro bono, help in literacy programmes or help the homeless, a low key celebration of that fact helps to convey to the public that lawyers are not all solely money focussed. I suspect this would work in the US as well as New Zealand and the UK. hi!This was a really excellent post! Another really interesting post. I agree that you can go too far down the personal route: that’s the reason I keep my Linkedin and Facebook worlds separate. Linkedin shares a degree of personal information, as does my blog, because authenticity is important to me, but it doesn’t cross the line into full personal disclosure. Of course, there may be work relationships which evolve into true friendship, but to begin with I wouldn’t necessarily want to share my holiday photos with a potential client, although I’d be perfectly happy with them knowing which football team I support. Thanks — I really enjoyed looking at the Edelson website (very familiar already with Axiom), but there is one thing that I found uber puzzling. Here they are (Edelson) so progressive and hip, and the first line is their bio is where they went to school??? Huh? That is a very helpful and thought provoking blog.I really enjoyed looking at the Edelson website (very familiar already with Axiom), but there is one thing that I found uber puzzling.